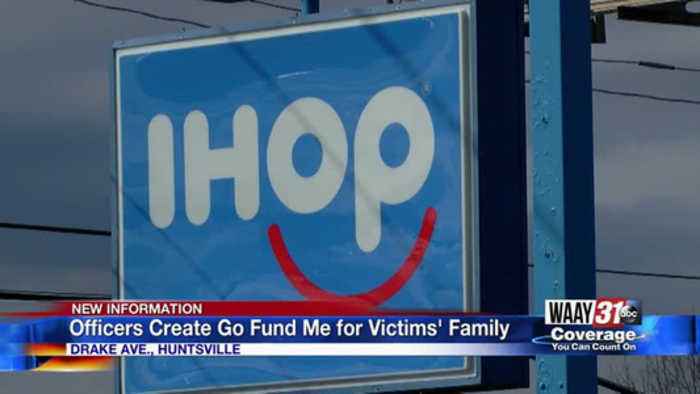 Huntsville police created a Go Fund Me account to raise money for funeral expenses for the family of the man killed inside an IHOP on Drake Avenue. Update you on air and online. We're learning new information about the deadly shooting inside an i-hop on drake avenue. Police tell us both men who fired weapons had gun permits. And the case is now up to a grand jury. Police say roderick turner shot and killed roy brown last week, when he was angry about a carryout order. Brown's son jay, who was wounded from the shooting, fired his own weapon and killed turner. Roy brown's funeral was today ... and this afternoon we've learned huntsville police are helping his family. An officer and his team created an account to raise money for funeral expenses, and more. Dan shaffer has the evening off. Waay 31s alexis scott is live at the ihop to explain why the officers want to help. Huntsville police officer james andrew works third shift ... he and his fellow officers come here to this restaurant often. They knew roy brown, and his son jay. James andrew, 3rd shift police officer "with having two people shot in a family, we just thought that'd be the best way to help." That help-- coming from a go-fund me account that has now raised more than 7 thousand dollars. James andrew, 3rd shift police officer "we're in ihop at least 4 or 5 nights a week. He always took real good care of us, so we just thought we'd try to do something to help the family." Officer andrew says he wanted to help the brown family fast, but had no idea the go fund me account would get this much attention. James andrew, 3rd shift police officer "the family is definitely overwhelmed by all the support from the community." Officer andrew says the ihop hasn't fully reopened since the shooting ... their night shifts are limited. James andrew, 3rd shift police officer "all 3 sons worked for ihop so it's really hurt the family all the way around, so anything that they can do to help is greatly appreciated. Officer andrew told me the entire family was able to attend roy brown's funeral today. His son jay, who was wounded in the shooting, is out of the hospital and slowly recovering. In huntsville, alexis scott waay31 news.